Brendan McCarroll will know the answer to the trivia question if it ever comes up: Where did former amateur great Gary Wolstenholme win his first professional title at the age of 49? Unfortunately for McCarroll, who led going into the final round of the Europro Tour event, the answer is the 2010 Stoke-By-Nayland Championship in Essex. As McCarroll closed with a three over par 75 to finish tied for second with James Busby, he got a perfect view as playing partner Wolstenholme carded a three under 69 to finish four clear on 15 under par. 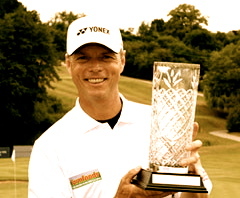 Awarded an MBE in 2007 for his services to golf, Wolstenholme won 218 caps for England, played in the Walker Cup six times and helped win the World Amateur Team Championship in 1998. He’s not shy about telling you about his amateur record but he certainly needed a boost, having had little success since he turned professional in 2008. He collected £10,000 but hopes his first victory will prove to be a springboard to more success when he attempts to join the Senior Tour in the autumn. “Winning this tournament is certainly up there with the other things I’ve achieved,” he said. “The fact I’ve achieved so much as an amateur doesn’t matter as in effect you’re back to square one as all of a sudden you’re playing for your living. “When you’re playing for money even if you’re not in contention you don’t give up. You have to make the cut and get the money. All the money and points that you get added to your Order of Merit total really makes a big difference. “But it was important for me to prove to myself and other people that I’m still a good player. “The EuroPro Tour is a good standard of play and the top ten or 20 are really good golfers. Although I’ve been knocking on the door in the last few weeks, it’s great to make the transition and win an event. Hopefully it’ll open some more doors for me. McCarroll was aiming for his first victory on the Europro Tour but bogeys at the fourth, sixth and tenth cost him dearly. However, his share of second place was still his best ever on the Tour, beating his previous effort of tied fourth at the Players Club in Bristol in July 2007. He earned £3,750 for his efforts. Challenge Tour — Chris Selfridge continued his run of good play with a level par 71 in the AEGEAN Airlines Challenge Tour by Hartl Resort in Germany. Richard Kilpatrick, Gareth Shaw, Brendan McCarroll and Dara Lernihan chill out by the lake in Austria. Picture courtesy of AlpsTourGolf.com/A spot of late afternoon fishing was just what Irish trio Brendan McCarroll, Gareth Shaw and Dara Lernihan needed after moving into contention for victory on the Alps Tour in Austria.